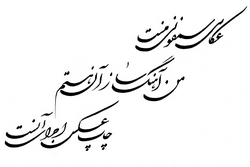 SAMPLE PERSIAN TATTOO DESIGNS - QUOTES Order Your Persian Tattoo Now! Three variations for the quote: "You are my mate, my soul, my love, and my heart"
"Photography is my symphony, I am the A poem about hope and strength "Without others yes; without you, never!" composer, and print is the performance"
Four variations for the word "family" Three variations for the quote "My family, my God"
Four variations for "God is with us"
Three variations for "My life, my family, my friends"
Three variations for "My family, my life"